The mission of the Couples Institute International is to direct body-mind-spirit healing, through therapy, education and research, to couples and relationships of all persuasions, thereby creating a wellspring of relational understanding that will heal the divisions of family, community and world. Relationships are hard work, yet are well worth the effort. Paralyzing fear and anger that we all feel at times can destroy a relationship. Becoming fused with our defensiveness locks us into overt power struggles or quiet, energy-draining boredom. We drown in the pain of our hurt feelings and contemptuous indignation toward our partners. Yet, scholars and philosophers for centuries have recognized the value of relationship for unlocking love, energy, creativity, and a deep sense of well-being that connects us with all things. At the Couples Institute International, we are deeply committed to helping couples in the difficult work of transforming their relationships from fear to love. We do this through Integrative Body Psychotherapy, an approach to individuals and couples that awakens our bodies and identifies then neutralizes cognitive distortions that interrupt our deeper aliveness and well-being. The body and mind work together, and we cannot approach one without the other, for to do so would be to ignore one’s power to undo the work of the other. Integrative Body Psychotherapy directs many unique breathing, movement, and cognitive interventions toward creating a satisfying and stable sense of well-being. From this place, profound changes in relationship are possible. Frank "Sandy" Evarts, Ph.D. and Barbara Kess Evarts, Ed.S. are fully committed to helping couples achieve a lasting and satisfying relationship. They have each practiced in the counseling field for several decades. They have realized that no relationship is easy and bring a compassionate, non-judgmental approach to their work with couples. 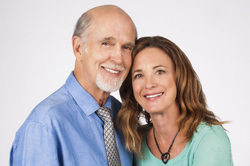 Their interventions and strategies for helping couples have evolved from the therapy practices and therapists they believe have made the most useful and effective contributions to the field of couples therapy. Foremost among these is Integrative Body Psychotherapy. "This workshop and these therapists gave us some powerful tools. In this workshop we learned breathing and movement skills to balance our nervous systems, cognitive skills to calm ourselves down, and a theory of personality that helps us talk meaningfully about the fears that come up in our lives. This was very, very helpful." "Barbara and Sandy taught us mind and body integration techniques that have helped us maintain a healthy and exhilarating relationship ever since."